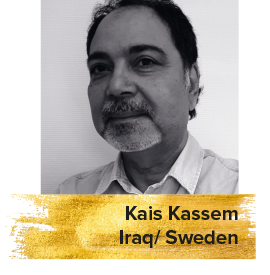 An Iraqi journalist and film critic based in Sweden, Kais Kassem holds a PhD in Journalism from the University of Czechoslovakia and has been working as a journalist since the 1970s. He writes film reviews in many Arab newspapers. Kassem was a jury member at a number of prominent film festivals including the Abu Dhabi Film Festival and Karlovy Vary International Film Festival. He is a member of the Network for the Promotion of Asian Cinema (NETPAC) and the International Federation of Journalists (IFJ).